Those using the E-5 and E-6 TEM Highways can reach our facilities by following the Atatürk Airport from the airport exit over to the Istanbul Fuar Merkezi road. Those using the coast road can reach the facilities by following the signs to the Atatürk Airport. Make an immediate right after passing the World Trade Center blocks and you’ll arrive at the facilities by entering from our signboard posted at the turn. Boarding the Aksaray- Atatürk Airport Metro line, exit the metro at the DTM – Istanbul Fuar Merkezi station, which is situated directly in front of the WOW Istanbul Hotels & Convention Center. 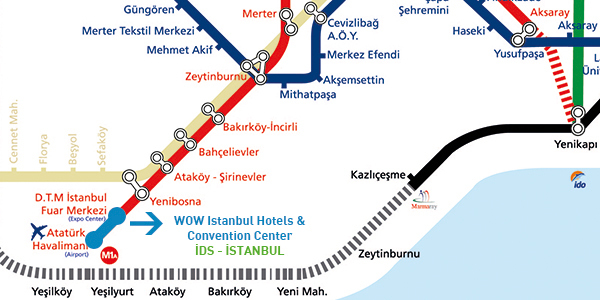 You can transfer from the Zeytinburnu or Şirinevler Metrobus stations to the Airport Metro line. It’s possible to find a taxi in front of the facilities 24-hours a day. Sabiha Gökçen International Airport– 60 min. *** These are average estimated time of arrival, subject to change according to the traffic and routes chosen.